In this tutorial, we will learn a very important topic ArrayList in Java with example and programs in the collection. The interviewer may ask one or two questions from this topic. So we will try to learn you in a simple and easy way so that you can easily understand it. ➲ java.util.ArrayList is Resizable-array that can grow or shrink as needed. It is created with an initial size. When this size is exceeded, the collection is automatically grown. When objects are removed, the array can be shrunk. ➲ Elements are placed according to the zero-based index. That is the first element will be placed at 0 index and last element at index (n-1) where n is the size of ArrayList. ➲ It uses a Dynamic array internally for storing the group of elements or data. 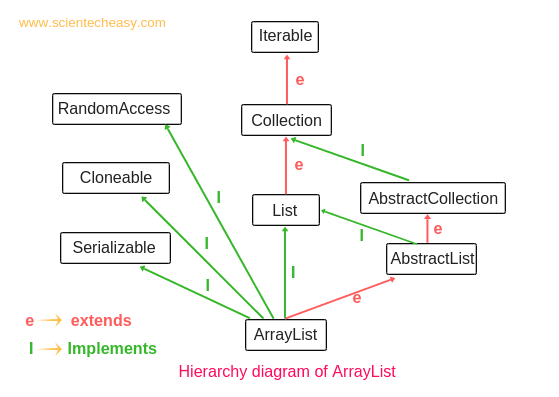 Hierarchy diagram of ArrayList can be shown in the below picture. ➲ ArrayList implements the List interface and extends AbstractList(Abstract class) which implements List interface. ➲ It also implements 3 markers interfaces- Random Access, Cloneable, and Serializable. Marker interface is those interface which does not have any methods or any member variables. It is also called an empty interface because of no field or methods. ➲ RandomAccess Interface is a marker interface that does not define any method or members. It is introduced in Java 1.4 version for optimizing the list performance. ➲ RandomAccess interface is present in java.util package. ➲ ArrayList and vector classes implement a random access interface so that we can access any random element with the same speed. For example, suppose there is a group of one crore objects in the ArrayList. Assume that the first element is x, 10th element is y, and 1st crore element is z. Now assume that first element x can be accessed within only 1 sec. Due to the implementation of random access interface, the 10th element and 1st crore element can be also accessed within the 1 sec. Thus, Any random element we can access with the same or constant speed. Therefore, if our frequent operation is retrieval operation then ArrayList is the best choice. ➲ Serializable interface is a marker interface which is used to send the group of objects over the network. It is present in the java.io package. ➲ It helps in sending the data from one class to another class. Usually, we use collections to hold and transfer objects from one place to another place. To provide support for this requirement, every collections class already implements serializable and cloneable. ➲ A cloneable interface is present in java.lang package. ➲ It is used to create exactly duplicate objects. When the data or group of objects came from the network, the receiver will create duplicate objects. The process of creating exactly duplicate objects is known as Cloning. It is a very common requirement for collection classes. 1. Resizable-array: ArrayList is a Resizable array or Growable array that means the size of ArrayList is can increase or decrease in size at runtime. Once ArrayList is created, we can add any number of elements. 2. Index based structure: It is an index based structure in Java. 3. Duplicate elements: Duplicate elements are allowed in the ArrayList. 4. Null elements: Any number of null elements can be added in ArrayList. 5. Insertion order: It maintains the insertion order in Java. That is insertion order is preserved. 6. Heterogeneous objects: Heterogeneous objects are allowed everywhere except TreeSet and TreeMap. Heterogeneous means different elements. 7. synchronized: It is not synchronized. That means multiple threads can use the same ArrayList simultaneously. 8. Random Access: ArrayList implements random access because it uses index based structure. Therefore, we can get, set, insert, and remove elements of the ArrayList from any arbitrary position. 9. Performance: In ArrayList, Manipulation is slow because if any element is removed from ArrayList, a lot of shifting takes place. For example: If ArrayList has 500 elements and if we remove 50th elements then the 51st element will try to acquire that 50th position, and likewise all elements. Thus, it consumes a lot of time in shifting. Creating an array list object is very simple. First, we will declare an array list variable and call the array list constructor to instantiate an array list object and then assign it to the variable. 1. ArrayList al=new ArrayList(); // It creates an empty ArrayList with default initial capacity of 10. That is we can store only 10 elements as shown in below picture. Suppose we insert the 11th element into an array at 10th position, what will happen internally? Once ArrayList is reached its maximum capacity, a new ArrayList is created with new capacity =(current capacity*3/2) + 1 = 10*3/2 + 1= 16 and copies all these existing elements into a new array before adding the new elements and then reassign the reference variable to the new array objects. The old default array objects of the collection are gone for the garbage collection. Similarly, If we try to insert 17th element, new capacity= 16*3/2 + 1 = 25. 2. ArrayList al=new ArrayList(int initialCapacity); // It creates an empty ArrayList with initial capacity. If you know the initial capacity, you can directly use this object. So that performance of the system by default will be improved. For example, suppose our requirement is 500 elements, we will go for this method like this. 3. 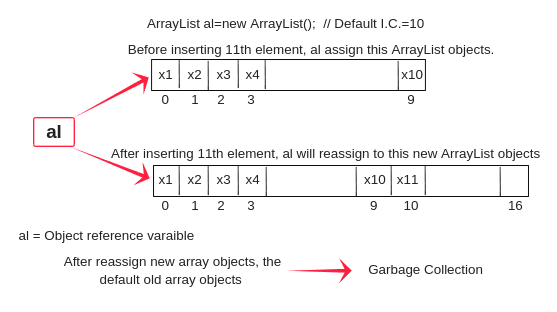 ArrayList al=new ArrayList(Collection c); // It creates an array list that is initialized with the elements of collection c.
ArrayList list3=new ArrayList(list1); // list1 is the elements of collection. If you are using Java 1.5 or later, we can also specify the type of elements in the array list object. ArrayList<String> al=new ArrayList<String>(); // The advantage of specifying a type is that when we try to add another type of an element, it will give compile time error. Here, List can be used to store only String types. Storing any other type will give the compilation error. Note: We cannot use primitive data types as a type. For example, ArrayList<int> is illegal. How do we manually increase or decrease the current capacity of an ArrayList? ensureCapacity() method: This method is used to increase the current capacity of ArrayList. Since the capacity of an array list is automatically increased when we add more elements than current capacity but to increase manually, ensureCapacity() method is used. ArrayList<String> list=new ArrayList<String>(); // Here list can hold 10 elements. (Default initial capacity). list.ensureCapacity(20); // Now it can hold 20 elements. trimTosize() method: It is used to trim the capacity of array list to the cuurent size of array list. a. Method 1: Using Arrays.asList.
. .. .. . . ..
list.add("Shubh"); This will add "Shubh" at the end of the list. 2. boolean addAll(Collection c): This method is used to add a group of elements in a particular collection at the end of the list. 3. boolean addAll(int index, Collection c): This method is used to add a group of elements at a specified position in a list. 4. void add(int index, Object o): It is used to add an element at a particular position index in the list. list.add(3, "a"); // add element 'a' at position index 3 in the list. list.add(2,"Shubh"); // This will add "Shubh" at the second position. Let's see a simple example program. In this example, we have used duplicate elements, heterogeneous elements(i.e String and integer), and a null element. You will also notice that when a specified element is added at a particular position, the right side element is shifted one position right. After shifting, the object reference variable will reassign new array list like as shown in the above picture. Due to shifting, ArrayList is also time-consuming. 5. boolean remove(Object o): It removes the first occurrence of the specified element from this list if it is present. 6. void remove(int index): Removes the element from the particular position in the list. list.remove(2); // It will remove the element from the position 2. 7. void clear(): It is used to remove all the elements from any list. In this example, you will observe that when an element is removed or deleted from an array, the deleted element becomes null but the empty slot occupied by the deleted element stays in the array and any subsequent elements at the right side in the array is automatically shifted towards one position left to fill the empty slot that was occupied by the deleted element and object reference variable 'al' will be reassigned to the new array list like as shown in the above picture. 9. Object get(int index): It returns the element at the specified position in this list. 10. int size(): It returns the number of elements in the list. Size means the number of elements present in the array list. Capacity means the capability to store elements. 11. boolean contains(Object o): It returns true if the specified element is present in the list else it returns false. 12. int indexOf(Object o): It is used to get the index of the first occurrence of the specified element, if the element is not present in the list, it returns the value -1. 13. int lastIndexOf(Object o): It is used to get the index of the last occurrence of the specified element in the list. If the element is not present in the list, it returns -1. When to use ArrayList in Java? 1. We want to store duplicate elements. 2. We want to store null elements. 3. It is more preferred in Java when getting of the element is more as compared to adding and removing of elements. 4. We are not working in the multithreading environment in Java because array list is non-synchronized. I hope that this article will help you to learn ArrayList in Java with example and programs. This article has covered almost all the basic topic related to array list in Java. All the above programs are very important to clear the concepts.